Grizzly H0921 - Super Gold™, 2 oz. 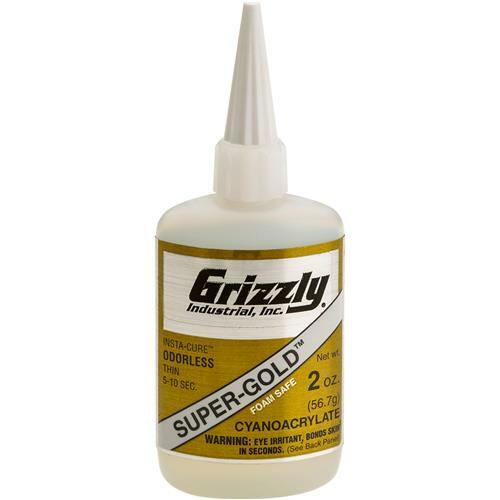 Odorless cyanoacrylates are formulated for use by those persons who have become sensitized or allergic to standard CA. Their use is recommended whenever sufficient ventilation is not possible. Odorless CAs have slightly less strength when compared to standard CA and are much more expensive. They can be used, however, on materials such as white foam that are otherwise dissolved or frosted by standard CA. Non-frosting and take only 2 or 3 seconds longer to bond. There are no fumes that irritate the nose and eyes. The SUPER-GOLD™’s do not attack white foam; therefore, they can be used in the building of foam core wings and the assembly and repair of plastic and foam ARF’s. They will not fog clear plastic.